The Colony Expanse installation is a swarm of 193 individually hand-painted bees. Each of the 193 bees represents a member state of the United Nations. 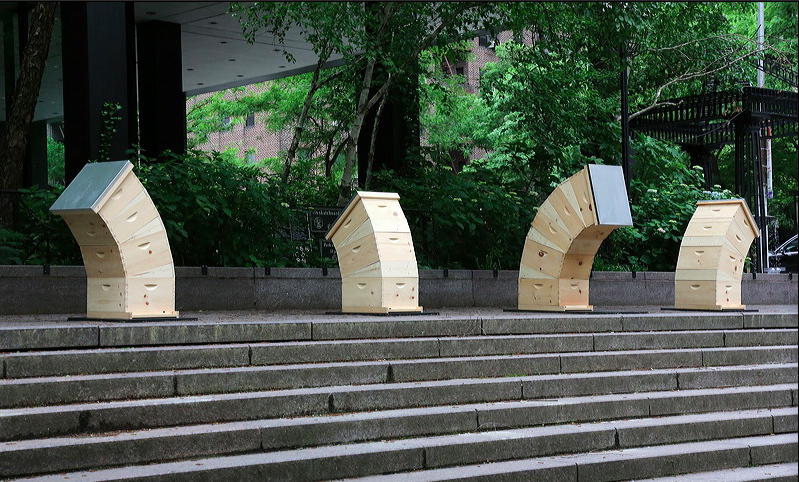 The piece made its debut in Dag Hammarskjold Plaza in NYC May 18, 2018 - August 18, 2018 along with Bending Hives - a four piece sculpture also by Matthew Willey. It began as a collaboration between The Good of the Hive, World Council of Peoples for the United Nations (WCPUN) and New York City Parks’ Art in the Parks. Colony Expanse has recently moved to Smithsonian’s National Zoo in Washington DC for display until November 30, 2018. Bending Hives has become a permanent installation at the zoo. Each of the Colony Expanse bees are available for purchase… When you purchase one of the painted bees, a laser-cut bee on sustainable bamboo will be sent to one of the 193 countries represented to raise even more awareness… and you get to choose the country it goes to. The goal is to connect all of 193 countries to this one piece of art and the movement growing around The Good of the Hive. "Bees are crucial for human survival. They do not belong to any race, gender or nationality. They transcend borders and politics. They are everyone's... critical friends. When honey bees swarm in nature they risk everything. They leave the safety of their hive and enter into the unknown as the precious queen and her hive leap into a state of utter vulnerability for the possibility of expansion. This installation, much like the first phase of a honey bee swarm, is about the potential for change, and the vulnerability and human connection required to achieve it. The Colony Expanse bees are essentially hovering in the uncertainty of what comes next. They are exposed to the elements much like the bees in nature and vulnerable to decomposition. As they hang now at the Smithsonian at least 1/3 of the bees are beginning to warp and change from exposure to weather. 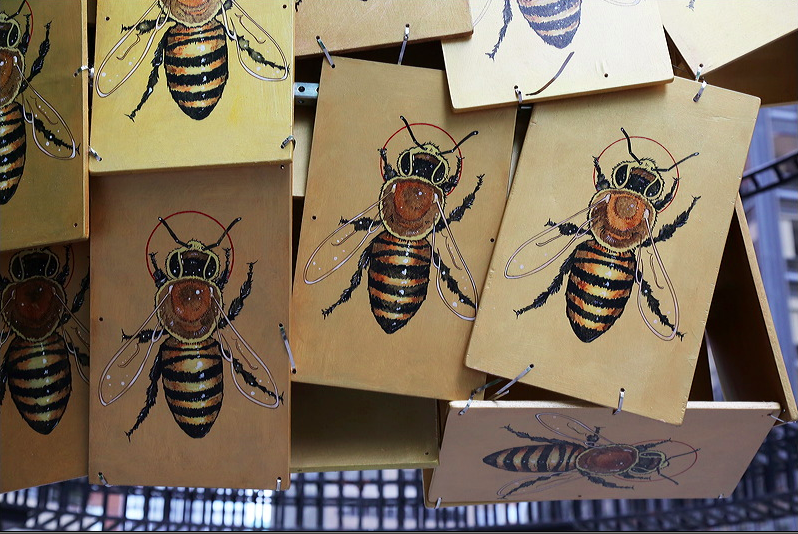 With each bee that is purchased, a signed, laser cut bee on bamboo will be sent to one of the countries represented. You can choose from any that have not already been chosen or you can leave it to us. We are working with the World Council of Peoples for the United Nations to bring these bees out to locations around the world. With active human participation, Colony Expanse becomes a living, breathing, example of humans being aware of, and connecting around, the importance of bees and pollination. The bee and her hive have played a huge role in our evolution as a species, and they support our food systems on a daily basis. If we can all agree about one tiny thing like the importance of a bee, we just might start to remember that we can agree about other things, too. Global issues like pollinator health are better solved when we face them together. There is a cavernous gap between the overwhelming details of environmental issues like honeybee health or pollination, and having that information understood by people at a local level. Communicating effectively, and long term, is crucial in creating positive change. 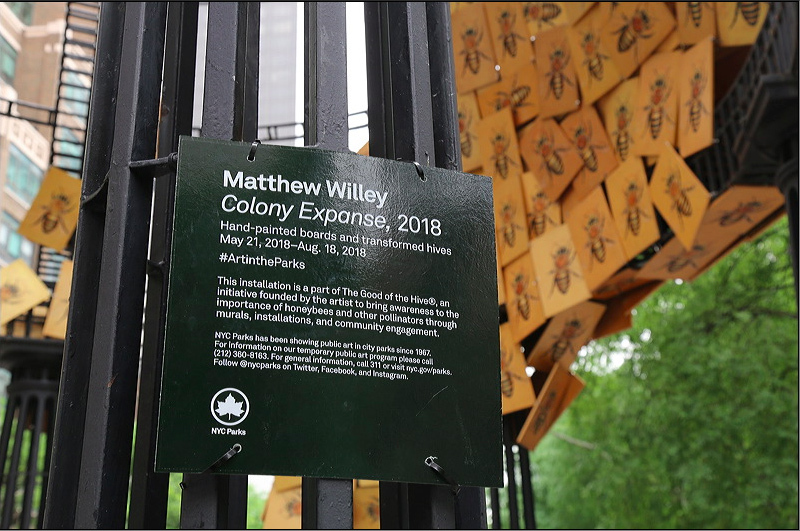 The goal of the Colony Expanse Installation as well as The Good of the Hive is to create art that brings people into connection with the idea of the bee, her beauty and her importance. Matthew has been engaging and educating people about bees with his murals non-stop for the past three years. He has personally painted over 4000 bees in 15 murals and spoken to thousands of kids and adults alike on his mural sites. The next phase of the Colony Expanse Installation - as it expands and the bees find their way to the corners of the human populated world - will not only create a kinetic piece of art that physically brings bees into the minds and hearts of people, it has the potential to show us that magical things can happen when we come together for a common cause. There is beauty in repairing that which is damaged. SupportThe purchase of one of these bees supports The Good of the Hive and Matthew's work and invests in the future. Special thanks to Mira Spiritvoice, Sean Pace, Sherrill Kazan, the Dag Hammarskjold community, Nick Browne and the myriad of others that have helped bring this piece to life!